Assassin’s Creed: Liberation launched alongside Assassin’s Creed III and told the story of Aveline de Grandpre, an Assassin who wages a personal war against the Spanish for taking control of New Orleans away from the French and those responsible for keeping and mistreating slaves. Originally released for the PlayStation Vita, Liberation finds itself on the PlayStation 3 with a perfunctory “HD” tag slapped on the end. Liberation HD retells Aveline’s plight to help slaves become free in 1760s New Orleans, utilizing her well-honed skills to meet this goal. Having not played the original version, I cannot attest for the game's quality on the handheld. As a remastered title, while it certainly looks good on the console, Liberation is a pretty poor show both from a franchise and technical point of view. Part of the problem is the game's misfortune of being released after Assassin’s Creed IV: Black Flag, a game that made up for the last game's shortcomings. The quality of the protagonist’s characterization is weak because she barely has one. What made Edward Kenway so compelling as character was his allegiance to no one save for his crew and fellow pirates. For the majority of the game, he owed nothing to the Assassin’s, unburdened by the Creed until it suited his purpose. Much was done to establish Edward as an uncouth scallywag who develops over time and becomes the hero the Caribbean deserves. Aveline, on the other hand, comes off as a bit flat and underdeveloped, which is quite a shame. Aveline’s personal story isn't explored as much as Ezio, Kenway and Connor before her. The game begins with the player controlling her as a child walking the streets of New Orleans with her mother (a tutorial stage) only to be separated and dragged away by people unknown. The scene quickly shifts to her as an adult in order to introduce the combat tutorial. From there, the game barrels through the story, barely taking the time to explain why Aveline is living with a white couple whom she calls mother and father and there’s very little explanation for how and why she joined the Assassins. Motive seems to be enough (though it really isn't) as she fights to protect her family’s financial interests, invests in smuggling operations, free slaves and fight back against the Spanish occupation of New Orleans. Given the amount of time Ezio, Connor and Edward were given to develop and find their identities as members of the Assassin brotherhood, the hastiness of Aveline's characterization turns her into a regrettably forgettable character. Liberation's mission structure is filled with classic Assassin’s Creed standbys. Primary missions are conducted in familiar ways, such as tailing important NPCs, picking out targets from a crowd, infiltrating restricted locations and, of course, assassinating numerous targets of interest. Performing secondary objectives during a mission sequence will yield a Full Synchronization for that memory. Many of these optional objectives are pedestrian and in some cases, nearly impossible to miss unless done on purpose. Pretty standard stuff, really. The game gets a little interesting during the combat phase (largely reproduced from ACIII) due to a chain kill system. When available, time stops at the press of a button and if at least two targets are in range, you can “tag and execute” them resulting in an elaborate and cinematic kill animation. Fun as this is, simply countering makes combat quicker and more efficient to the point where this chain kill system is somewhat pointless. Another new addition to Liberation is a persona system that allows Aveline to equip three different disguises intended to mask her identity. Her Assassin persona is her primary outfit, allowing her all the tools and abilities needed to strike her foes. The Slave persona grants additional blending options, including the ability to pass through guard posts if carrying cargo crates. Dressed in exquisite finery, the Lady persona permits Aveline to charm targets in order to distract them, though she is unable to free run. Each persona generates notoriety differently and with changing areas littered across the map, it adds a small, yet noticeable, degree of strategy in managing wanted levels. That said, there's rarely an opportunity to switch out these disguises during missions. Tearing down wanted posters or kill witnesses are additional methods of clearing gained notoriety. As with any Assassin’s Creed adventure, there is always a non-critical management simulation. The version in Liberation is similar to the fleet missions in Black Flag; You can send ships to various ports in order to buy or sell various goods for cash. Around the city, there are numerous shops for sale that offer new costumes, weapons or decorations for your warehouse hideout. Money generates pretty quickly in the game, with ample rewards given for finishing missions and looting bodies and treasure chests. While there are things to do, it isn't enough to save Liberation from being a boring game. There isn't much to do outside of a few collection quests and unfulfilling side tasks. Damaging the product further are unfixable annoyances. Tooltip and tutorial screens will hound your every step, repeating often and cannot be switched off. The game behaves in such a way that the tooltip will not stop repeating until you do what it asks, though that can be difficult when on mission. The game is also very buggy. In one sequence, I was instructed on how to use a whip against an enemy, but pressing the onscreen buttons did nothing because the game registered as Aveline not having the whip in her hands! In the game's most frustrating race sequences (second only to the final chase in ACIII), the game failed to acknowledge my controller inputs numerous times and at one point, didn't recognize my fall into a pit as a game fail state, forcing me to wait out the clock before restarting. The story itself is uninspired and what should be a heartfelt reunion ends up being nonsensical. The Templars and Those Who Came Before are virtually nonexistent for a large part of the game and when they do eventually make themselves known, it comes off as shoehorned. The only nice thi I can say about the plot is the "present day" element. CitizenE, a hacker, will occasionally chime in and identify a target to be killed in order to view an "unedited" plot specific cutscenes Abstergo has whitewashed. You are, after all, playing THEIR video game. The "Abstergo Entertainment" angle featured so prominently in Black Flag was fun and significantly better than Desmond Miles' story, so I was pleased to see it again. Assassin's Creed Liberation HD fails to meet the same measure of fun that previous games in the series managed to accomplish. Aveline is uninteresting and the game itself suffers from technical problems, uninspired mission design and a weak story that can't seem to pin down what exactly Aveline is trying to accomplish. While Black Flag reminded me that Assassin's Creed is capable of greatness, Liberation brought to mind franchise entries I am more than happy to forget. Assassin’s Creed Origins is representative of Ubisoft Montreal taking a good, long look at the franchise and mixing things up. By moving the game away from its unique structure and into something within Grand Theft Auto and Horizon’s sphere of influence, it succeeds in upsetting the apple cart. Assassin's Creed: Unity does have its moments, but any goodwill is ruined by a complete breakdown in online functionality. Assassin’s Creed IV: Black Flag is a game I enjoyed immensely. It controls and plays better than Assassin’s Creed III and its hard not to enjoy causing all sorts of mayhem on land and sea. Its not perfect, combat is over simplified, but the pure joy I experienced sinking ships and hunting sharks overshadows the niggling issues I encountered. There's a multiplayer component that is sorely lacking player versus player ship combat. Let's hope that gets patched in sooner rather than later! Lush scenery, great characters, costumes and a wonderfully realized naval element are woven into a beautiful, playable vision of the golden age of piracy. While gamers were busy uncovering the Borgia conspiracy and seeking out Altair’s memories in Constantinople, a different team had been charged with crafting an entirely new Assassin’s Creed adventure just after the release of the second game. 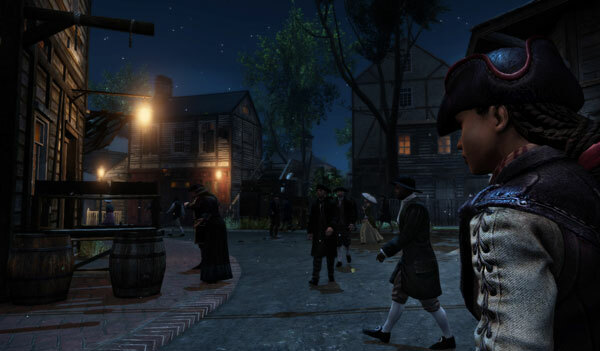 In many ways, Assassin’s Creed III feels as if it were made independently thanks to a welcome graphical facelift and new gameplay enhancements. One charge that can never be levied at Ubisoft is a lack of ambition. After five console Assassin's Creed games in just six years, and a smattering of handheld offshoots, the French super-publisher has set it sights on the one device that could be called upon to bridge the gap between fighting the Templars at home, and fighting them wherever one goes: the Playstation Vita.